Igneous, the remarkably pretty and well-paced student project I highlighted a few months back, is finally complete and can be downloaded for free right here. To summarize: Igneous is a 3D platformer where you guide a rotund tiki totem through a collapsing volcano. I thought the pre-IGF version was spectacularly intense and satisfying, and my opinion hasn't changed any in regards to the final version: Igneous was, and still is, a must-download for anyone who loves platformers and/or chase sequences and/or purdy graphics. 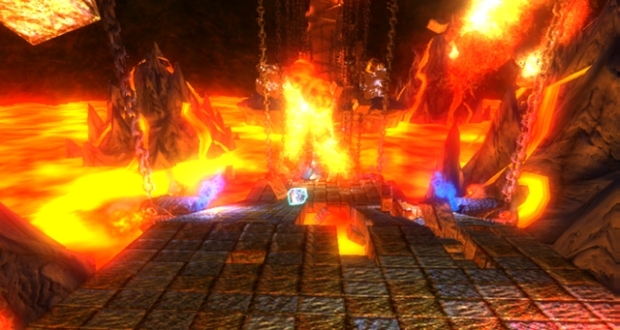 Granted, this new version cut out one of my favorite levels involving a rising lava flow and a circular chamber, and it can be really hard to figure out where you are and where you need to go in the orgasmically explosive final level, but the game's so briskly paced and just plain exciting that I find it hard to complain too much.